What is BarkBox? BarkBox is a New York-based provider of dog products and dog-friendly technology. The company offers BARK subscription service, every month hundreds of thousand treats, chews and toys are being shipped to dogs across America and Canada. Bark & Co services range from the production to the packaging to the graphics on social media. They design every piece of each month’s box to create mind-blowing toys for dogs. Each box contains likeable items to create fun for your dog, but if your dog doesn’t like an item it could be swapped for one they will love. Each month BarBox designs a new theme for their owners to dig into, built on a simple idea of finding the best stuff in the world that is made specially for your own dogs. Your BarkBox is customized based on the size of your dog, BarkBox comes in different collections depending on the size of your dog. When you subscribe to a BarkBox, each month you are to receive 4-6 customized items for your dogs. Every box should contain no fewer than two natural healthy bags of treats, two innovative fun dog toys and a dog chew. Every other item in the box is a mystery and that’s half the fun. BarkBox matches the theme of each month to the season of the month, so you expect holiday-themed boxes during the holidays. 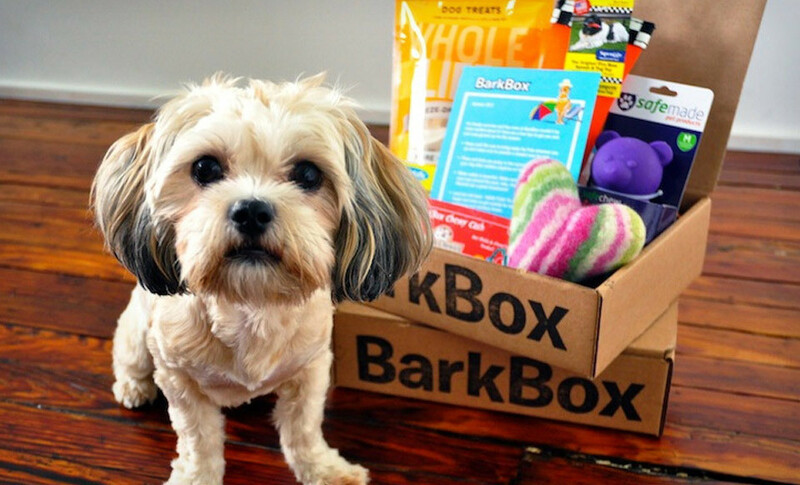 Of all the competition among many other monthly dog subscription for dogs in the market today, BarkBox continues to be one of the most popular and recommendable boxes available because of their outstanding dedication to value and quality. A happy team is always provided to every BarkBox customer, also with a merry band of devoted dog professionals based in the USA that can be reached via text, chat, email and phone at any time of the day. They will be available to answer all your questions and also provide simple dog tips. All BarkBox meal treats are made in The USA and Canada, containing wheat, soy, corn, and it is filler-free, no artificial preservatives, flavor or wired ingredients, but just delicious snacks that dogs crave. BarkBox subscription plans start at $21 per month, and their Super Chewer BarkBox (for dogs who need a challenge) starts at $39. Making it affordable and flexible to give your dogs fun time and treats.